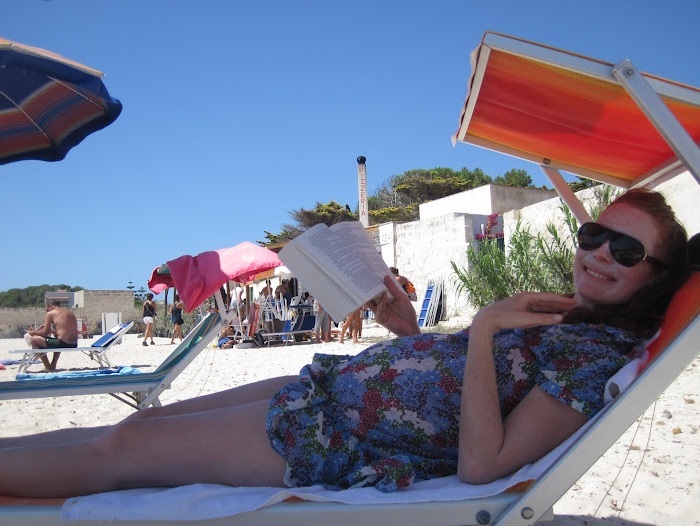 A continuation of Sicily in Summer! and Sicily Part 2 . . .
6. 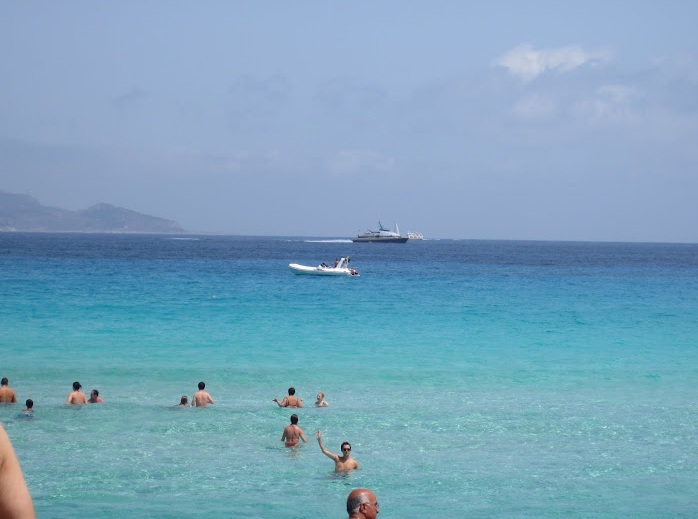 Favignana. 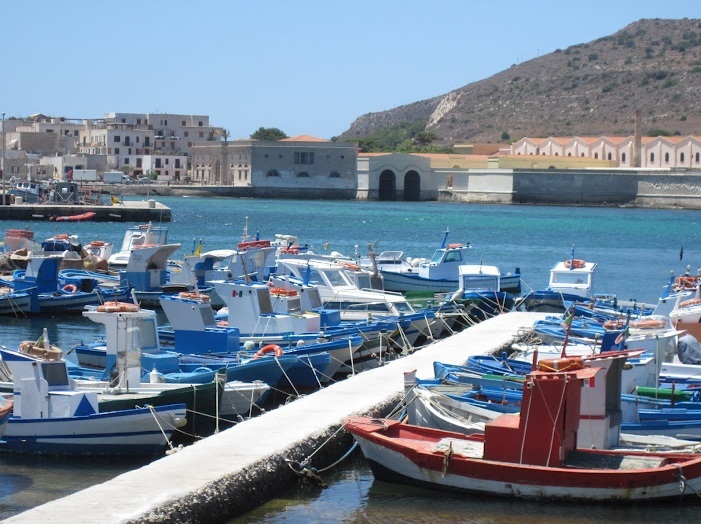 Favignana is a tiny island off the northwest coast of Sicily, reachable by ferry from the city of Trapani. It’s one of the Aegadian Islands. This little island is not for everyone. There didn’t appear to be any fancy hotels and all of the beaches are hard to reach, with rough, albeit crystal clear blue, waters. You definitely need a car to get around the island, so we brought our car on the ferry. At first we were surprised by its rusticness and the unwelcoming nature of the stone land and its wild waters. However, it quickly grows on you. There is one town center with fantastic bars and restaurants, and after two days there you start to recognize people because the village and entire island are so small. So we started to get the feeling, again like in Panarea, that we’d discovered a hidden gem and all of our research had paid off. We didn’t meet a single American or hear any English on this island, which is a mark of a quality vacation for my husband. This little island is extremely photogenic, so while I planned on writing up the last city of our Sicily tour in this post, I think that will have to wait until later in the week . 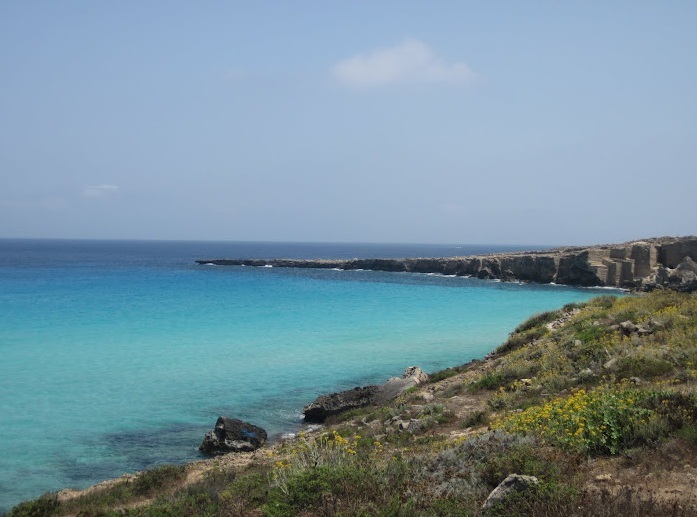 . . for now, hope you enjoy all these photos of Favignana. 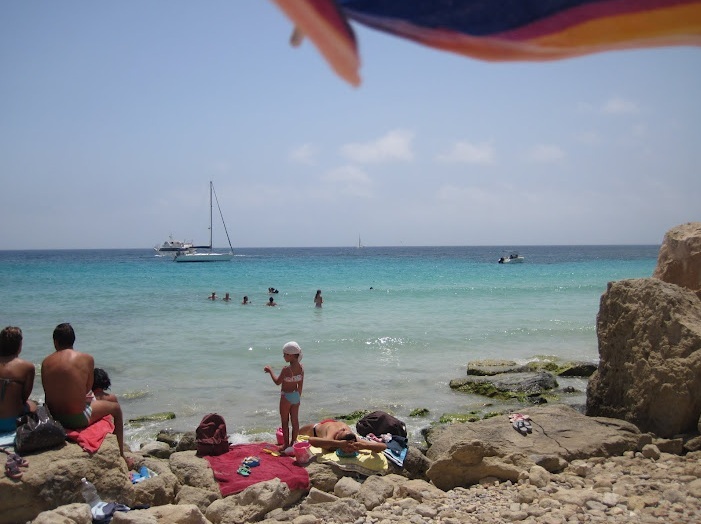 As you can see this beautiful beach has very rough and craggy rocks, painful on the feet, so you need to wear sandals. The water is shallow for about 100 yards out. The sand below your feet is the whitest and softest sand you can imagine. It feels amazing! The owner of our hotel / bed & breakfast. 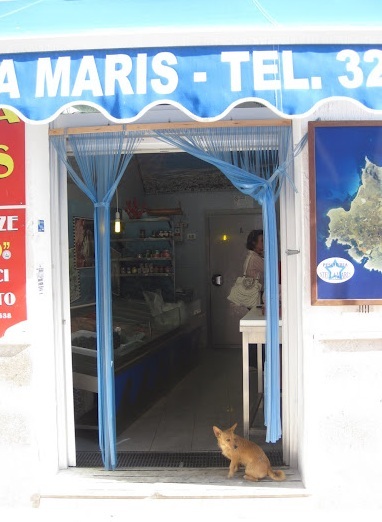 Our favorite mercado, with the cutest pet of Favignana always waiting at the door. Other side of the island, Favignana. Thanks for responding! 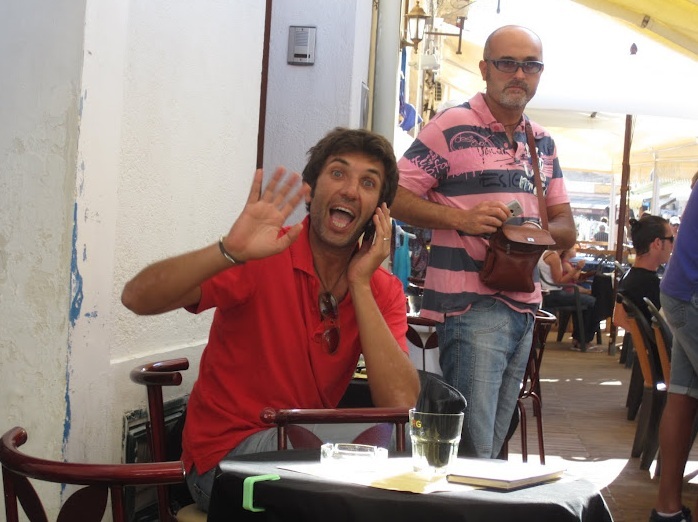 We’re still trying to plan are Sicily trip and I’d love to hear more about your itinerary. Salina looks amazing–what hotel did you stay in there? Would you say that was your favorite/most beautiful island? And how did you decide to do the islands and not more of Sicily (Syracuse, Noto, etc)? 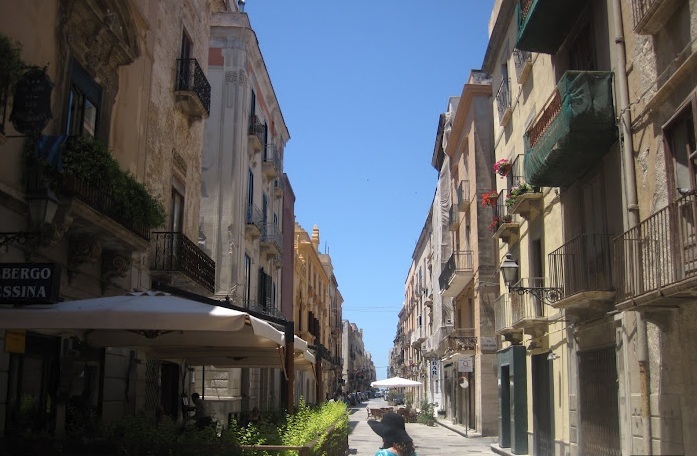 Basically–I’m trying to decide if Sicily is worth the trip for a big vacation! We’re also considering Santorini, but Sicily seems more interesting. Any thoughts you have would be awesome. Ok, enough questions. Thanks!! OVERALL: I think Sicily has a lot to offer and Santorini is quite small. However, if you want to be pampered, there are probably fancier hotels in Santorini. In Taormina there are some grand hotels though, if you look for them . . If you want a lot to do and breadth of adventures and experience and places to visit and history, then I’d say Sicily. 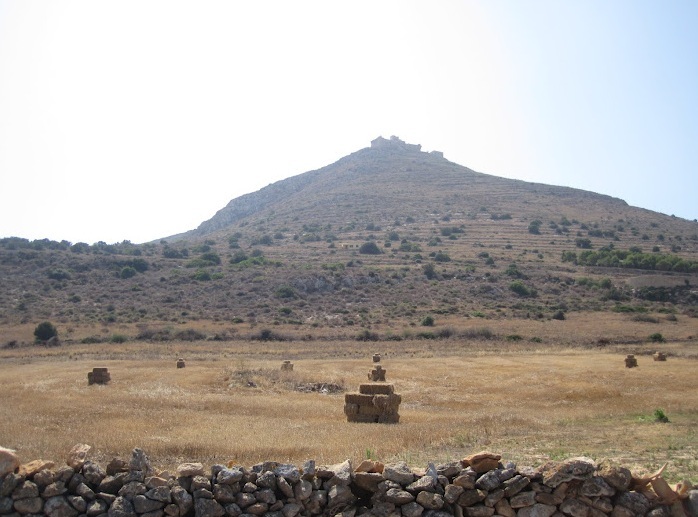 HOTELS: We stayed in Hotel Ravesi in Salina but I think the better hotel to stay in is Hotel Signum. We ate dinner at Signum twice. Their staff is wonderful and you’ll be treated really well there, wined and dined if you like. At Ravesi the desk staff were kind of rude but by the pool there’s wonderful food and a beautiful view, so in my opinion the best thing to do: Stay at Hotel Signum and go to Hotel Ravesi for lunch and then again for Apperativi. They have the best apperativi (food and drinks before dinner). And the poolside there is really beautiful and so relaxing! The rooms at Ravesi are nothing to write home about though. I’d maybe stay a few nights at Lipari or you could take a day trip there from Salina (what we did). I’d combine Salina with time in Taormina, it’s so pretty there and from there you can hike Etna, visit wineries near Mt. Etna, go to beaches, and walk around the pretty town at night (I’d recommend staying in town). GREECE: In Santorini, my friend stayed at Hotel San Antonio in Santorini and it looked absolutely amazing!!! I’d go there and then do other half of the vacation in Mykonos. We went to Mykonos for 5 days and loved it, check out my Mykonos post. 🙂 Hope this helps… let me know what you decide! Thanks for the info! So helpful. Sorry to treat you like a travel agent! We’re probably going to do Sicily and are just trying to figure out how to split our time. For 3 or 4 nights on the islands, would you suggest Panarea or Salina (for some reason those appeal to me more than Lipari)? We just want somewhere beautiful to relax and explore. Does 3 nights seem like enough for that? Anyway…thanks!! Yes 3 nights is enough! If you are adventurous and would rent a scooter, then Salina. If you’re more into relaxing and feeling like you’ve discovered a secret island where you can “fare niente” and enjoy lush gardens, and where the taxis are golf carts because no cars are allowed, then choose Panarea. Thanks! Where did you stay in Panarea? Everything mentions Hotel Raya, but not sure if it’s worth it! I do like the idea of renting a scooter, but really just want the most beautiful island! Thanks again! We stayed at Hotel Raya. That’s the only place to stay – as in, you’ll be missing out if you don’t stay there. It’s REALLY worth it! Let me know how you like it . . . we loved it and will definitely be back someday. It’s really off the beaten track so there are no Americans, but if you go between July 21 and end of August I think there will be a LOT of Italians, as in the tiny island may be a bit crowded, because it becomes the party headquarters of the Aeolian Islands during that time. We were there at the end of June though, so did not experience the crazy party scene. Thanks! We’re going in early September so probably also not so crowded. Still trying to decide if we should stay in Salina or Panarea, or maybe splitting our time between them, but will definitely do Raya if we pick Panarea. It’s hard to figure out the ferry schedules in advance to find out if that works! Thanks again for all your help! We are going for Salina! We booked at the Hotel Signum and can’t wait. We’ll do a day trip to Panarea. Thanks for all your help. I love your blog! Are you sure you can’t also stay one night at Hotel Raya? If you’re going there anyway, I think it’s worth it to stay at Raya for a night. It’s a magical place especially if you get a room up on the hill where they serve breakfast. Near the pool. Ask for that. Let me know … I think you should stay there a night! It’s very easy to do both, they are like 10 minutes away from each other (salina and panarea, i mean). Let me know ! Hi! We actually thought of that, but then figured it might be annoying to move islands for just one night. How much time did you spend total on the islands? We could reconsider and do Panarea at the beginning or the end. Is it that the hotel is so amazing or the island or both? We picked Salina because we figured there would be more going on and it looked so gorgeous, but now I’m regretting it. haha Maybe we will do 1 night in Panarea and then 2 or 3 in Salina. Does that sound reasonable to you? Is it very easy to get between the two islands? I was also wondering your opinion of Taormina–we kind of want to just spend one night there and then head to the islands for 4 nights since they look so beautiful and Taormina seems touristy (though also very pretty), but would love your thoughts. We’re then headed to the south of Sicily for another 5 days, so it’s not like we’d be only seeing the islands. Thank you so much! Yes, I think you should do both!! Do 2 nights in Panarea and then 3 nights in Salina, and on one of the Salina days you can take a day trip to Lipari. Hotel Raya is really special and unique. You’ll be happy you did this! Then you have two nights to eat at Panarea restaurants, and be sure to eat at Da Pina one night. Buy something at the Hotel Raya gift shop, too – I regret not doing this. You have two nights to lounge on the sunbeds by the sea at Raya or swim in the mineral pools until the sun sets. And then have an aperativi by the rooms at the top of the hill. Then on your one full day without travel, between your two nights at Raya, you can rent a boat for several hours from the harbar at Panarea to explore the crystal clear waters around the nearby islands and go swimming there, with our without a skipper (most people go without but we were lazy and hungover so went with). Oh and when you get back from the boat rides you can take a “taxi” (golf cart) to the nearby beach and have aperativi on the little Greek-style taverna there that overlooks the beach. Thanks for replying so quickly! Sounds great except we only have 4 nights total for the islands. 😦 So, I think we’ll do 1 night in Panarea, trying to arrive early, and then do 3 nights in Salina. I assume we can take a boat from Salina as well to explore the waters around the islands? Though I’m sure I’d take a skipper too–we have no clue how to drive a boat! Bottom line, I guess, is do you think 1 night at Raya is worth it? This means hardly spending any time in Taormina, but I don’t think I really care haha Thank you!! Well you can just do the boat on the morning you wake up in Panarea. And leave for Salina in the afternoon. Or arrive in Panarea very early on your first day and do the boats around the islands that day. You can’t do it from Salina, it’s too far. I think 1 night in Raya is worth it!! Arrive early in Panarea and leave late afternoon the next day, so you have 2 days. It’s definitely worth it, it’s really cool and different. Hmm, I liked Taormina but you can do 1 day there this trip and if you like it come back another time. There really are a lot of tourists. Go to the restaurant I recommended, it’s not so touristy since it’s a little walk off the main Taormina road, and it’s soo good!! Especially if you like olive oil. Get the orange and avocado appetizer!! Hope they still have it I guess. We loved that restaurant so much that we went back the next night, even though there are a lot of restaurants in Taormina (on our first night there we went to a not-so-good one). In Taormina we stayed at Villa Ducale which was really nice, but maybe Villa Carlotta would be better since you can just walk into town. Villa Ducale is up the hill a ways, there’s no pool, and you have to take the hotel shuttle to get everywhere. Villa Carlotta has a pool, a good location with a view, and is a short walk into town which is so pretty!! Both hotels have shuttles to the beaches which we found very convenient. We like these because they’re small but nice. Ok, thanks! So many decisions–I wish we could spend 3 weeks there! I think we’ll do 1 night in Taormina, 1 night in Panarea and 3 nights in Salina. I liked that on Salina we could go for hikes and explore the town and then maybe take a boat trip to Lipari. We could do Salina first and then Panarea instead, so I guess I’ll look into ferries and see. And thanks for the hotel recs for Taormina. I’ll look into both of those and will definitely check out that restaurant! I am so excited for the food in Sicily…I have heard it is even better than in other parts of Italy. Well, thanks again. This is so helpful. 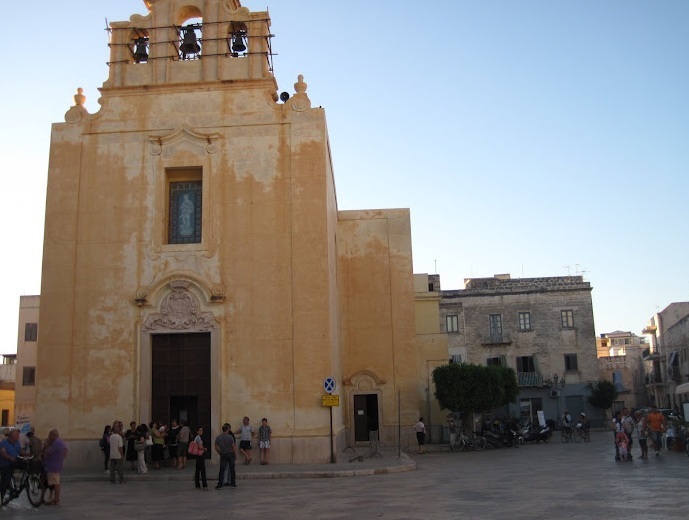 I have tried to read other trip reports on Sicily but yours has been the most helpful. Your description of imagining Salina when you were stuck in that scary road definitely sealed the deal for me in wanting to go there! 🙂 Thanks again! One more thing–did you rent a car on Panarea or just use buses/scooters? Many thanks! No, we just used buses and taxis on Salina and they were great. Some people rent cars I guess. Hi K! How was your vacation? Are you back? If you’re still there hope you’re having fun!!!! And also relaxing!!! Hi! Just got back a couple of days ago and it was so amazing–both fun and relaxing! Thank you so much for all your advice! We absolutely loved the Aeolians and both Hotel Raya and Signum. 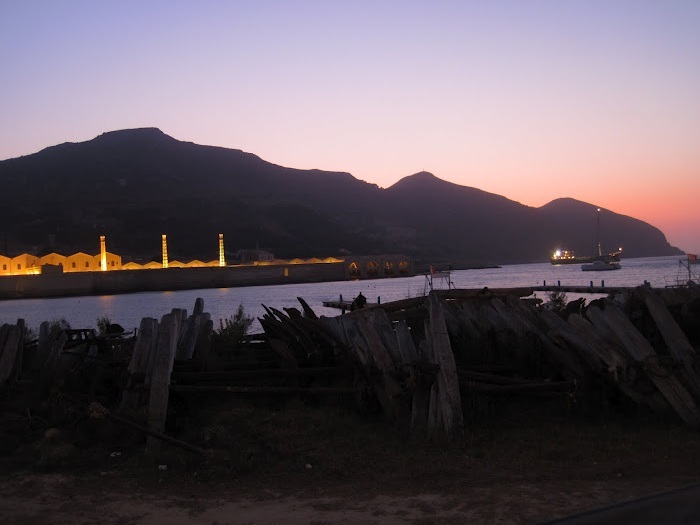 Spending one night at Raya was perfect–what a beautiful location–thanks for suggesting that. And I seriously could have spent weeks on Salina. So gorgeous. I am already trying to figure out how to get back. Thanks again!